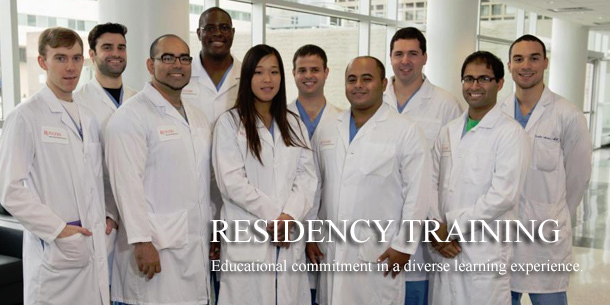 On behalf of the faculty and residents of the Rutgers New Jersey Medical School, Department of Orthopaedic Surgery, we are pleased to welcome you to our residency web site. Although we will attempt to give you a complete picture of our program, we're sure that questions will arise. We therefore encourage you to make inquiries to see if our Program is the right residency for you. The Orthopaedic Residency Program at the Rutgers New Jersey Medical School and Affiliated Hospitals is a five-year program. Our subspecialty coverage is complete and comprehensive. The mix of facilities provides a diversity of patients, environments, and pathology, which we feel is necessary for a well-rounded surgical education. Our research facility includes molecular, biomechanical, and biochemical laboratories and is an integral part of the residents' experience. More importantly, we emphasize the fundamentals of thinking and planning, as well as performing orthopaedic surgery. It is our goal to graduate well rounded, well-read, skillful surgeons who have the necessary skills and experience to choose either academic or private practices. This, as all residency programs, will undergo change over time, but our commitment to train humane, broadminded and competent orthopaedic surgeons will not.